The best deal in Balboa Park just got even better—purchase a Balboa Park Annual Explorer Pass and get FREE admission to Maker Faire San Diego. Purchase the Balboa Park Explorer Family Pass, receive admission to the entire weekend of Maker Faire San Diego, up to a $168 value, and unlimited general admission to 16 Balboa Park museums for 365 days. The best deal in Balboa Park just got even better—purchase a Balboa Park Annual Explorer Pass and get FREE admission to Maker Faire San Diego, the Park’s annual celebration of innovative technology, arts, and the Do-It-Yourself culture, happening October 7-8, 2017. 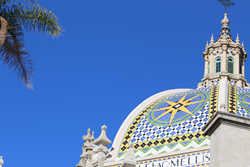 Purchase the Balboa Park Explorer Family Pass, receive admission to the entire weekend of Maker Faire San Diego, up to a $168 value, and unlimited general admission to 16 Balboa Park museums for 365 days. Now in its third year, Maker Faire San Diego is a unique, family-friendly event for innovative, creative people who like to tinker and love to create, and also for those curious minds who want to see what new and cutting-edge things are just around the corner. The Explorer Pass provides passholders the opportunity to explore the rich cultural and artistic offerings of Balboa Park in an easy and affordable way, and is the best money-saving option for enjoying all the Park has to offer, including the more than 250 local and regional makers displaying their creations at Maker Faire San Diego—mostly inside participating museums. Talk with makers, get hands-on, and visit the exhibitions on display. It’ll be a fun-filled weekend!